High Pavement has seen some development over the last year. With the arrival of Missoula, Filthy's and The Loom alongside established Nottingham classic venues like the iconic Pitcher and Piano it's an area that's certainly offering more for discerning drinkers and diners. The Loom opened late last year directly opposite the Pitcher and Piano to clearly offer us something a little different. It's frontage appears that of an 18th century townhouse which extended further into warehousing from it's historic role within the city's famed lace trade. The name comes from a 19th century loom from the building which was formerly Nottingham's Museum of Lace. The Loom offers up something a little different. A contemporary British restaurant and Jazz bar. Last weekend we went along to taste their new Spring/ Summer food menu for one of our reviews. The interior of the restaurant area is beautifully light and comforting whilst keeping the feel of the original 18th century townhouse with traditional wood tables, plenty of interesting trinkets and lots of flora on display. Table sizes vary from a nice selection for couples to bigger options for family or office. It's hard to believe we're into February already as the days start to get longer again and we'll soon be into Spring as the weather hopefully warms up soon. 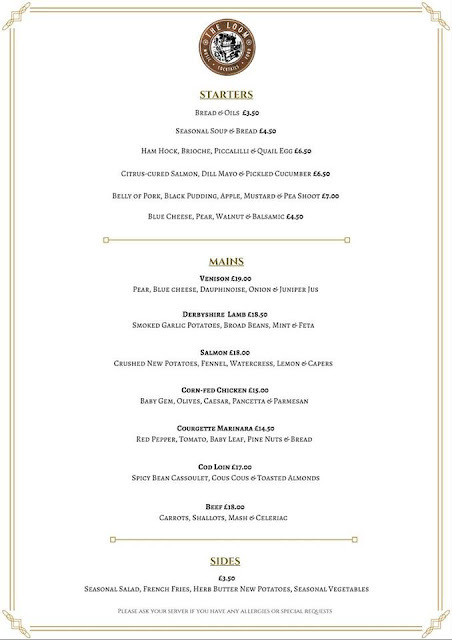 The Loom's menu could be considered to be a little minimalist in terms of it's offerings with six starter options and just seven mains however there seems to be something for everyone and it's clear straight away the attention to detail within the make-up of the dishes and therefore we were expecting something a little more flamboyant than we're used to. We opted for the Belly of Pork, Black Pudding, Apple, Mustard and Pea Shoots (£7.99) as we love a nice bit of piggy, as well as the Blue Cheese, Pear, Walnut and Balsamic (£4.50) which sounded an intriguing combination. With beautifully cooked belly pork featuring a delicately finished crackling this was a beautiful looking starter, Featuring black pudding in granular form instead of as a solid chunk made it to be almost a dry, delicate crumb which worked well around all the other flavours For someone that doesn't usually do 'green' the pea shoots added a subtle sweetness to the dish with the fantastic apple sauce. A visually appealing starter for any meat lover. Equally as visually appealing was the blue cheese starter which featured finely sliced fried bread which we could have eaten all day. Coupled with a rich, creamy mature blue that packed plenty of flavour amongst the fresh pear and intriguing balsamic pearls which added an interesting contrast to the dish. For our main we opted for the Cod Loin with Spicy Bean Casoulet, Cous Cous and Toasted Almonds (£17.00) and the Derbyshire Lamb with Smoked Garlic Potatoes, Broad Beans, Mint and Feta. The Cod Loin can out with a generous sized and perfectly cooked piece of fish without a single bone in sight. The flakes pulled away with just delicate teasing with a fork. Accompanied with a gently spiced 3 bean casoulet to add a subtle flavouring with the delicate fish. The cous cous added some starch to the mix although was a little on the dry side- having tasted cous cous prepared by the Berbers high up in the Atlas Mountain's I'd normally expect something soft, light and incredibly fluffy however the cous cous as part of our meal was nothing like that although it did add a good contrast in textures for the dish. Whilst the cous cous didn't match up to our usual expectations it didn't detract dramatically from the dish. Presentation wise the Cod Loin didn't match up to our starters in terms of their visual appeal. Whilst the constituent ingredients themselves hardly lend themselves to a pretty spread across the plate after our beautifully presented starters we were looking for a little more. It was however, a very nice, well flavoured dish with a fantastic piece of fish. The Derbyshire Lamb, however did come out with an appearance much more in line with what we had seen from our starters, We two sensible pieces of lamb without significant signs of any fat and with a consistency that allowed our knives to slice through like they were made from better. The meat was lovely and flavoursome, working well with what could only be described as the smoothest mashed potato we've ever tasted with a hint of garlic to add warmth. The broad beans, mint and crushed feta worked well to add contrasts around the smoothness of the potato and lamb to create a very nice dish indeed that we would happily order again. We often struggle to get to pudding but tonight we fancied a treat and after what we'd tasted expected something a little bit special for pudding so had to take the plunge and have a good taste. On that note we opted for the Chocolate Peanut Butter Garnache with Raspberry Sorbet and Ginger Crumb, as well as the Lemon Meringue with Lemon Sorbet. The Chocolate Peanut Butter Garnache was light, despite looking like a couple of bites will leave you full it had a lightness which encouraged indulgence. The addition of peanut butter added a smoothness to the palate to be counterbalanced by the wonderfully tart raspberry sorbet and sharpness of the ginger crumb. The tastes we amazing and we'd certainly consider the dessert again if we hadn't already been drawn to the full-on lemony lemon-ness of the lemon meringue with it's impeccably grilled swirl, immaculate pastry and gooeyness as you dipped your spoon in to reveal a creamy meringue with lemon sauce beneath. Add in the tartness of the lemon sorbet and you have my perfect dessert. Who needs chocolate! Both desserts were priced around the £7 mark. Lemon Meringue with Lemon Sorbet. We kept things relatively simple drinks wise with a large bottle of sparkling water (£3.00) and Jem opted for a fruity, medium dry glass of Spanish White Wine (£3.60) to work with the delicate flavours of the cod. We had a fantastic meal at the Loom. We were a little dubious at first when we saw the winter menu but it's clear that they're starting to expand their offerings as the bar and restaurant establishes itself. We ate at 7 PM and at no point was the restaurant full on a Saturday night and with the food we ate it should be with the exception that February is often a meagre month for many. With the minor exception of of the Cod Loin our food wash impeccably presented and oozed quality. The Cod Loin was a lovely dish but just lacked that little bit in presentation in comparison to our other dishes, Prices seem reasonable for the food and effort that's being put into the dishes. Whilst plate size might not satisfy those with a big appetite there are optional sides to add alongside your meal should you choose. 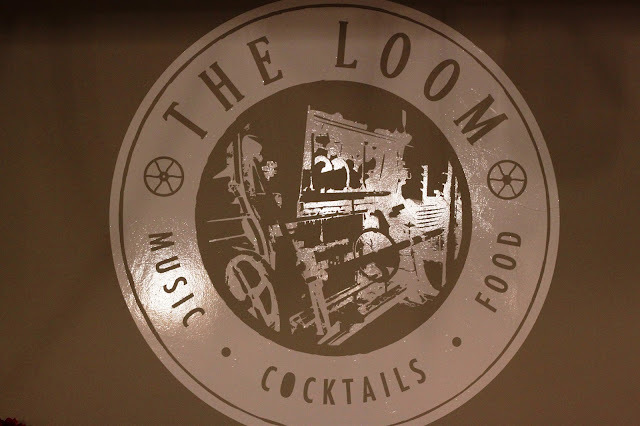 Whilst some of our meal (starter and main course) was complementary we value our morals and the review above is our own thoughts and impressions of our visit to The Loom, Nottingham. We've had quite a few invites this month but always adhere to write our reviews as if we'd be paying ourselves in full.